These mice keep asking me more questions that I'm comfortable with so the post is down subject to further thinking! Time for a Christmas break methinks! Best wishes all round. OK, I've stopped trying to cover every aspect of these mice, some of the more exciting bits really need a whole series on their own. So here we have the slightly truncated version of the original post. Before we come to the consequences of excessive superoxide generation in complex I I'd just like to run through a small part of this rather neat paper on what happens if you virtually eliminate it. Take a mtG3Pdh knockout mouse and feed it on a very low fat standard style lab chow and it will grow pretty well normally. Bear in mind that both of the diets in the study are very, very low in fat. Ultra low fat means that dietary fat, especially when PUFA based, is not going to generate any insulin resistance based on electron transferring flavoprotein dehydrogenase reducing the CoQ couple. It's going to have to be mtG3Pdh which controls insulin facilitated calorie delivery. This particular model may not behave as simply on a higher fat diet. There are stacks of unknowns about this model. Before we come on to anything else, what happens when you inject any old mouse with exogenous insulin? 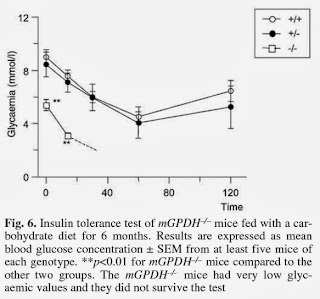 Simple so long as you have the dose rate carefully chosen, blood glucose falls, cells develop insulin-induced insulin resistance, mouse survives. You have to be modest in your dose but it's not too difficult. We talked extensively about the Somogyi effect back in the Zombie days. 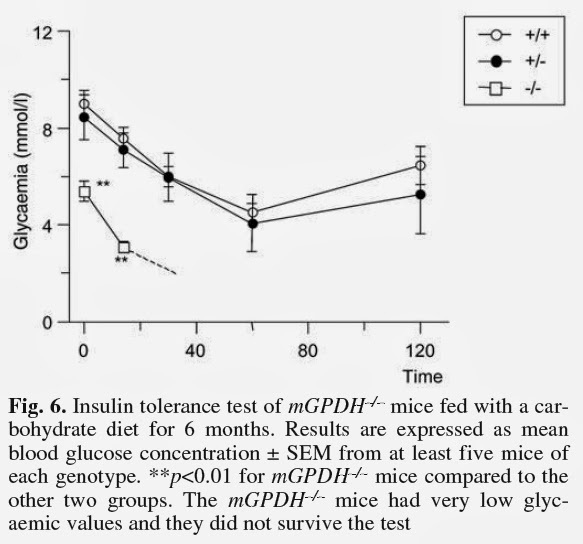 The mice in the present study happen to have been fed a high sucrose/minimal fat diet for 6 months. The two top lines are the wild type and heterozygous knockouts for mtG3Pdh. The lower, terminated, line represents the full knockouts. The line is terminated at around 30 minutes because all of the mice were terminated, ie they died of hypoglycaemia. 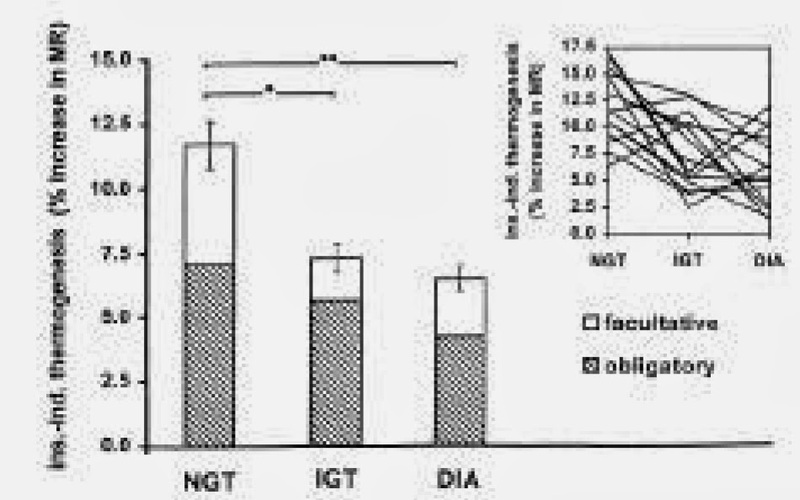 They needed to develop insulin-induced insulin resistance and, without mtG3Pdh, it never came. RIP. The paper also goes on to show many, many other fascinating things about these mice but the more I try to cover all of these features the more it obscures the main finding. For insulin resistance on a ultra low fat diet you need mtG3Pdh up and running. It may be worth coming back to the effects of fructose and oxygen consumption from this paper but that's another set of ideas. That's all for today. I just wanted to link these mice to the normal physiological insulin resistance generated by mtG3Pdh (when glucose/fructose is the primary metabolic fuel) and the protons ideas. They all fit together. Core message: For hyperglycaemia, exogenous insulin or fructose to induce insulin resistance you need mtG3Pdh for effective reverse electron flow through complex I to generate (essential) superoxide/H2O2. This is important. So is going over the top with this normal physiological function, which looks to be rather bad for you. Post-obese people are probably rarer than pre-obese people but at least they can be quite conclusively identified. The main problem with most post-obese folks is that they are usually only ephemerally in that state and they rarely achieve a truly "normal" bodyweight. But there are some people out there who have done this. So how do conventional medics get obese people to lose 80% of their excess bodyweight and keep that weight off for more than two years? Well, it's quite easy. You just rearrange their digestive system to virtually join their stomach to their colon. Tatarinni wrote the paper. Eat, have a bowel movement, eat some more, poo some more. Maybe you have to eat sitting on the loo. Once patients have "adapted" to their bilio-pancreatic diversion they can get down to as few as 3-5 bowel movements a day, allowing them to leave the bathroom occasionally. 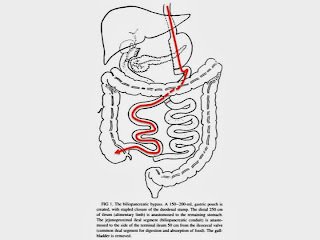 Total remaining absorptive gut is about 250cm long. This works for weight loss. Tataranni's paper is fascinating as it gives us a picture of the metabolism of eight post-morbidly-obese women who are close to an ideal BMI and who have been that way for over two years. 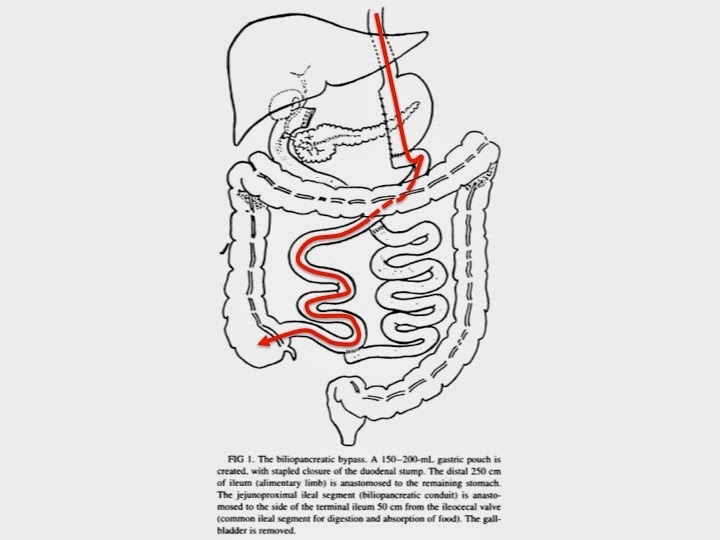 You need the caveat that these people have a markedly maligned digestive system, so may not represent their metabolic state pre-obesity, but they are very interesting never the less. You also could make an argument that these people, given a normal digestive system, would rapidly become obese again. So perhaps they may really tell us something about people who are pre-obese. The most striking aspect is that they are NOT insulin resistant. Fasting insulin and fasting glucose are quite, quite normal. 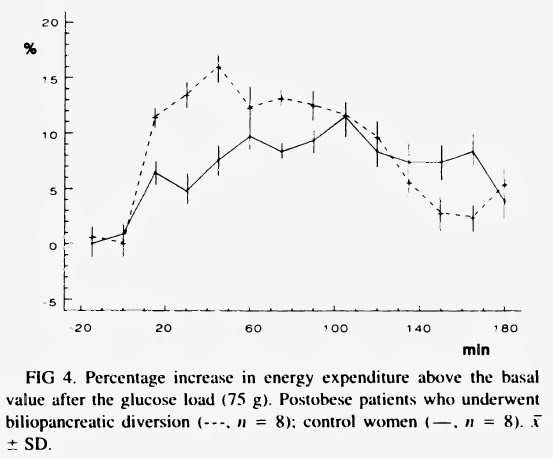 Their resting metabolic rate is indistinguishable from that of control women. But they are not quite normal. 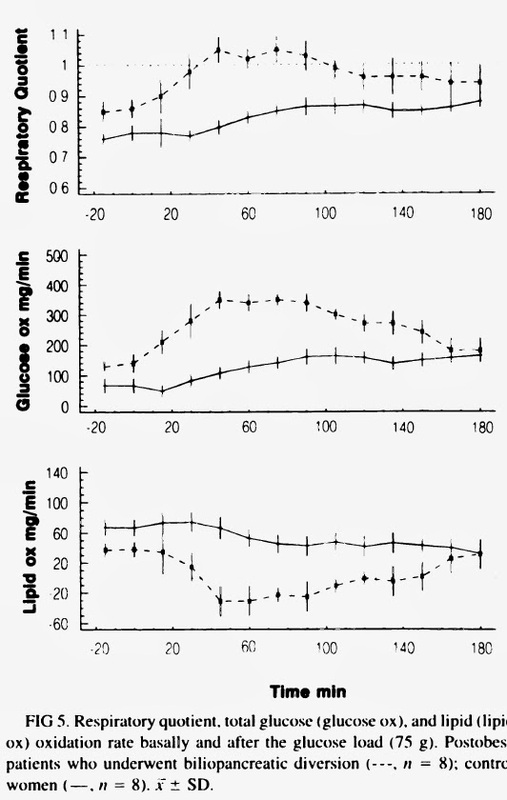 The response to a 75g oral glucose load shows markedly increased insulin sensitivity. 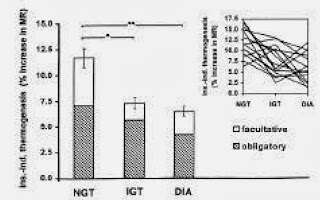 Let's just emphasise: Post-obese women with long term sustained normal bodyweight have a significantly increased sensitivity to insulin during an OGTT compared with never-obese women. Fasting free fatty acids are lower, as you might expect, albeit ns in a group size of eight. The excess energy expenditure is, in part, heat generated by the in-putting of high energy NADH electrons to the CoQ couple without pumping protons. I floated the concept that glycerol-3-phosphate might be a core protectant against caloric overload on an individual cell basis in the last post, by inducing insulin resistance. I also suggested that the other related function might be the diversion of excess calories to lipid storage, phosphorylated glycerol being essential for intracellular triglyceride formation. "After the oral glucose load, the RQ increased more in P0 [post-obese] than in C [control] subjects, reaching values > 1. Thus, lipid synthesis exceeded lipid oxidation in P0 subjects 45 min after the oral glucose load and continued to do so for 40 more min". What is happening is that these women accept glucose in to their cells very easily. The glucose is converted to pyruvate, this is decarboxylated via the pyruvate dehydrogenase complex to yield CO2 which increases the RQ. The acetyl CoA formed is exported to the cytoplasm as citrate. Obviously the citrate is formed by combining acetyl CoA with oxaloacetate, the latter can also be derived from pyruvate but this time via carboxylation, and hence the TCA never turns. Oxygen is never consumed. RQ >1.0. 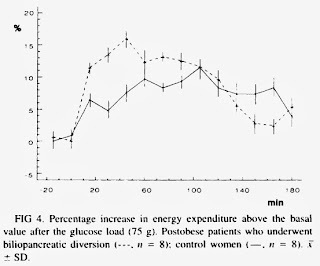 So these post-obese women are exquisitely sensitive to insulin, in particular they are remarkably efficient at de novo lipogenesis and at the inhibition of lipolysis. Were they like this before becoming obese? I think so. Why they might be like this is interesting to think about from the mitochondrial point of view. Might there be any way of controling their weigh gain without the need for gross malabsorption secondary to removing most of their gut? I was going to leave this as an interesting snippet but there are a few add-ons to these ideas. Some artificial models of this effect are available from various "pre-obese" rodent models. I had a think about them here. Edward emailed me a link to this paper about a post-obese case report from Dundee. This man has a normal digestive system, he simply didn't use it for 382 days. NB, these glucose levels are all very, very low. The authors feel that these values are real. Perhaps he may have been morbidly obese, yet still insulin sensitive. You need to have retained some insulin sensitivity to attain massive obesity without limiting weight gain by the transition to diabetes. But anyhoo, the trends are what interested me. 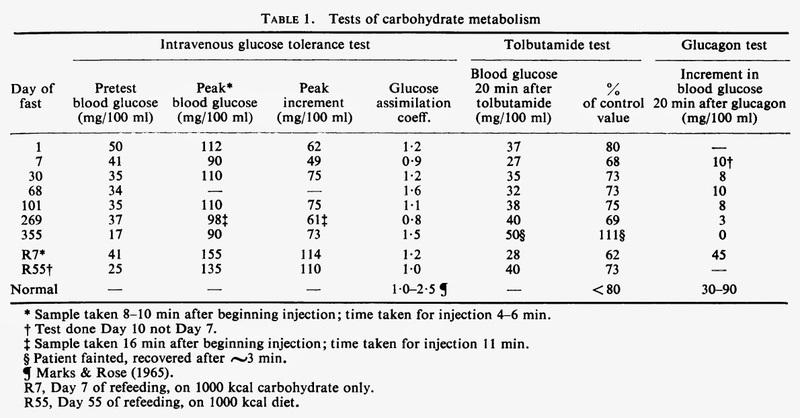 What we need to look at is the first column, fasting glucose levels. If we ignore day 355, where there was some sort of a hiccup, FBG was around 35mg/dl. This is quite low but the chap was in extended starvation so this might not be surprising. This is the level of glucose under deep, deep physiological insulin resistance. 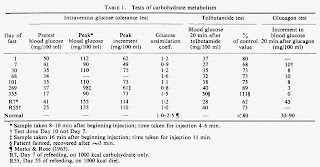 Ignore day seven value of re-feeding because metabolism will, in all probability, still be far from normal and the chap was only consuming liquid glucose at this time. Instead I looked at day 55 of re-feeding, while he was on 1000kcal of a mixed diet. His FBG was very low, about two thirds of what it was during fasting. This chap, like the Italian enterectomy women, was very, very insulin sensitive. 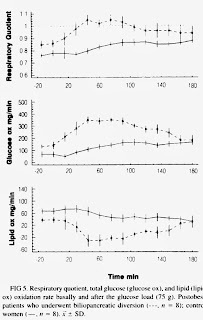 Insulin drives fat storage as well as hypoglycaemia. He kept the weight off for at least 5 years. Two points: This chap was a psychological outlier! Second is that 1000kcal/d, if it is Food based, is a LC diet even if it is also a low-everything-else diet too. I thought I might just put this snippet up as it's been lying around ready to go for some time. I've tried to tidy up some of the worst sentences. Happy Solstice! Here we go. The phrase "insulin induced thermogenesis" is, at first glance, a complete oxymoron. It is difficult to imagine any way in which insulin, that most effective suppressor of free fatty acids, might uncouple respiration to generate heat. The primary brown adipose tissue technique is to use UCP1, which depends on free fatty acid availability. But there are other ways to generate heat in addition to uncoupling the proton gradient. It is worth noting that some of the thermogenesis is "obligatory", by which the authors mean the exothermic storage of glucose as glycogen. I'm rather more interested in the "facultative" component. It is an abstraction of the ETC, grouping inputs by their redox potential rather than physical location and is now becoming pretty inclusive for most electron donors. All mitochondrial NADH inputs are through complex I at -280mV and these electrons flow from here towards the positive potential of +600mV, provided by oxygen at complex IV. They do work in the process, pumping protons to set up the delta psi which can be "wasted" to generate heat when needed. Without uncoupling, the process is efficient and energy from the electron is largely conserved. The interesting point is that mtG3Pdh inputs to the CoQ couple which has, we can now see, a redox potential of +20mV. Specifically, mtG3Pdh is taking a cytoplasmic NADH, which could theoretically be shuttled to the mitochondrial matrix, and hence to complex I, at -280mV, and inputting it to the ETC at +20mV. The energy lost by skipping from -280mV to +20mV would normally pump four protons and now appears as heat. After a glucose load any oxidation of the abnormally elevated FFAs of insulin resistant people still provides a continuous +20mV input using ETF dehydrogenase's FADH2 acting on the CoQ couple, which is ultimately derived from the FADH2 of the first step of beta oxidation, ie it's FADH2 transporting electrons all the way, there is no energy wastage when using fats to limit insulin's action. In the absence of these inappropriate FFAs, the correct way to reduce the CoQ couple is using mtG3Pdh which shuts down insulin's action at the cost of generating heat because it uses NADH, stepped down to FADH2, as a direct input at the CoQ level. We want a reduced the CoQ couple when there is metabolic oversupply as a reduced CoQ couple allows reverse electron flow through complex I and insulin resistance. Insulin resistance, via reverse electron flow through complex I, is what is wanted, heat is a by-product. Insulin, which activates a long chain fatty acid ligase to generate acyl-CoAs for anabolism/triglyceride formation, might well be expected to simultaneously generate the glycerol 3 phosphate needed for the triglyceride backbone. The diversion of FFAs to intracellular triglycerides can be viewed as protection against excess metabolic substrate supply. It strikes me as appropriate that the same molecule might also be used to generate the insulin resistance which limits substrate oversupply supply, if there is no fat available. I think I might leave this as a short post before we go on to the post-obese and insulin induced thermogenesis. And possibly on to mtG3Pdh knock out mice.